Fibber McGee & Molly, Phil Harris & Alice Faye and Penny Singleton & Arthur Lake in Blondie all heard differently on the West Coast. Fibber McGee & Molly heard at dinnertime? Phil Harris & Alice Faye getting laughs in the afternoon? Blondie broadcast an hour later than usual? What’s this all about? Welcome to Network Radio on the West Coast. All broadcast times listed in Network Radio Ratings, 1932-1953 are Eastern - and if you live in the Central time zone, you‘re accustomed to simply subtracting an hour. It’s been that way since the birth of Network Radio and remains to this day in all radio and television. But it was different - much different - in the Pacific time zone before network rules and recording techniques allowed an entire day’s program fare to be recorded and time-shifted which aligned East and West Coast program schedules. The combination of live network broadcasts and time-shifted feeds to the West Coast during the 1930's and '40's produced program schedules that would confuse any visiting listener from the East or Midwest. 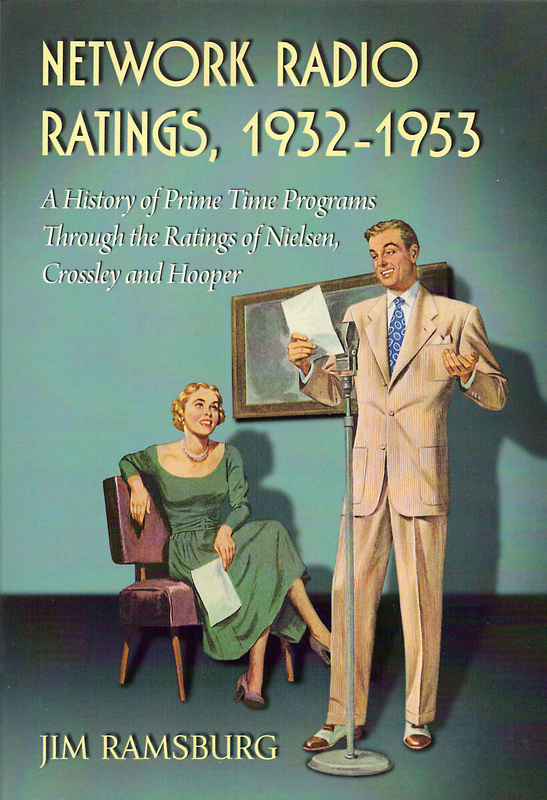 The Nielsen Company ratings from 1947-48 display both the East and West Coast feeds of all network programs. Combined with the Los Angeles Times radio program logs from the season, (see www.JJonz.us/RadioLogs/ ), the picture becomes clearer. For example, Fred Allen wasn’t heard on NBC’s Pacific Network stations at his familiar time of 8:30 on Sunday. Instead, Allen’s show was broadcast at 5:30 on Sunday afternoon. His 8:30 timeslot was taken on NBC‘s western leg by the long running Standard Oil Symphony Hour. Lux Radio Theater wasn’t on CBS West in its long held timeslot of 9:00 to 10:00 on Monday. It was broadcast live from 6:00 to 7:00. At 9:00 listeners heard the second CBS feeds of the half hour Inner Sanctum followed by the multiple run 15 minute programs, Bob Crosby’s Club 15 and Edward R. Murrow news and comment. Here’s the networks’ formula that kept their engineers in New York working the late shift well past midnight. As a general rule - with the exception of Sunday - programs broadcast before 9:00 p.m. on the East Coast were fed a second time to West Coast affiliates after 11:00 p.m. New York time. And programs broadcast after 9:00 p.m. on the East Coast were carried live by network affiliates in Pacific time zone. Below are the Top 50 programs of the 1947-48 season. Listeners from coast to coast heard 24 of the 50 programs simultaneously. These programs included 13 of the season’s Top 20. Meanwhile, 26 of the Top 50 programs were time-shifted with second feeds to the West Coast. Of these 26, only eleven - in bold - were heard on both coasts at identical clock times. The remaining 15 were scheduled at different times than in the East and two of them, The Big Story and The FBI In Peace & War, were broadcast on different nights. Lastly, The Lone Ranger was not fed to the West Coast for Friday night broadcast. It’s well known that NBC and CBS banned the recording of programs during the 1930's and '40's which led to many colorful stories about programs having been performed twice, once for the East Coast and a second time - three hours later - for the West Coast. The Blue Network, later ABC, relaxed the ban in 1939 and Mutual never observed it. The two networks also spent considerable sums recording and feeding their programs for delayed broadcast in the summer of 1946 to avoid the widespread confusion resulting from Daylight Saving Time which was then a state and local option. NBC finally dropped its ban against transcribed programs in the fall of 1948 which eliminated the need for two live broadcasts of shows - but performers were still paid an additional fee when a second broadcast on the West Coast was required. CBS followed suite shortly thereafter.